Israel is the land of the fast food sandwich, and these are your basic three varieties. Some restaurants serve all three (plus other options, like kebabs), while others specialize in one or another. 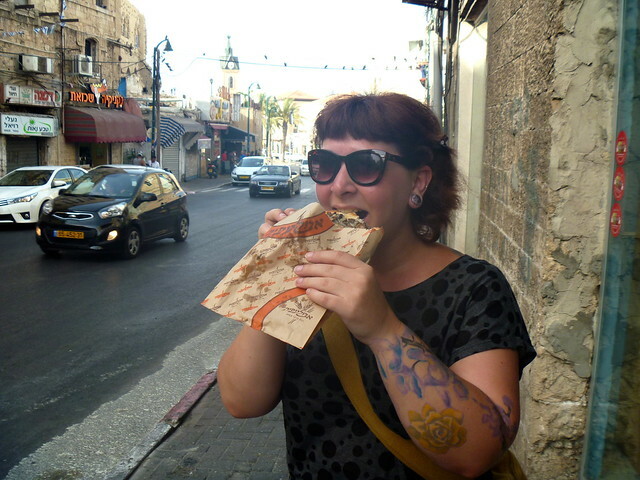 Falafel: possibly the quintessential Israeli fast food. If you have somehow been missing out on falafel for your whole life (I’m so sorry), it consists of fried balls made with ground chickpeas and herbs. Vegetarian and delicious. If you’re nice to the shopkeeper they might give you free falafel balls hot out of the deep fryer. Schnitzel: this is a different animal than the German wiener schnitzel, though I’m sure that’s where it originated. 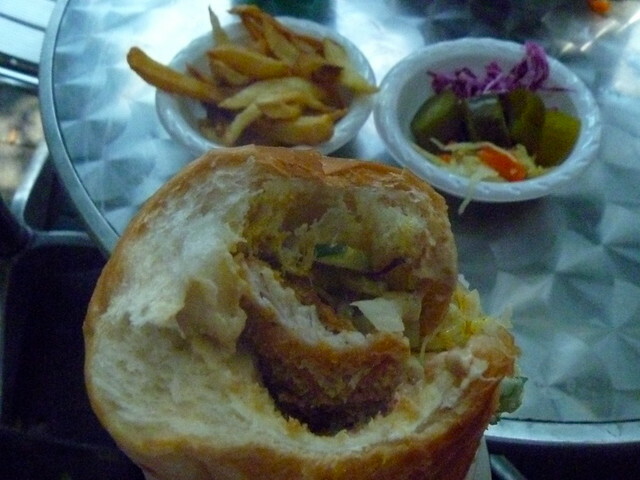 It’s basically just a breaded and fried chicken breast cutlet, but super good in a sandwich. Most places will give you a sandwich on your choice of bread: pita, laffa, or a baguette. Laffa is always the correct choice — it’s about twice the size of a pita for only a few shekels more, and it has a softer, chewier texture that reminds me a bit of Indian naan. I’ll sometimes make an exception for schnitzel, though, which is great on a baguette. You can also get a plate or platter instead of a sandwich if you want. Then they’ll load it up whatever assortment of fillings and toppings they have on hand: hummus, chili sauce, garlic sauce, tahini, fermented mango sauce (try it, it’s addictive), cucumbers, tomatoes, onions, eggplant, carrots, cabbage (often several types), pickles, and sometimes even french fries (either in the sandwich or on the side). It gets messy, but the more toppings, the more delicious it is. I’m firmly of the belief that if you don’t feel like you need a shower after you finish eating in Israel, you’re doing it wrong. Then there’s usually a whole OTHER salad bar (containing most of the same things) with small bowls where you can help yourself in case they somehow didn’t cram enough veggies into your sandwich. Definitely a good place to fill up! Hummus: No, it’s not just a dip. 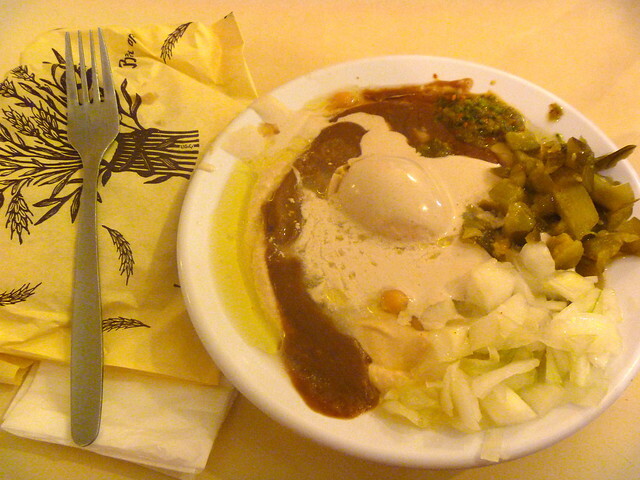 There are lots of hummus restaurants that serve up huge bowls of the stuff covered with toppings, whether it’s a pile of sautéed meat like I got at a stand in Jerusalem or the crazy concoction you see above from a restaurant in the middle of Tel Aviv’s Carmel Market: hummus topped with whole chickpeas, stewed beans, chopped onions and pickles, some sort of spicy relish, a hard boiled egg, and various other unidentifiable things. Served with a couple of pitas, it’s delicious and incredibly filling — two people could easily share a bowl. This one is more of a casual restaurant dish but you can always get a to-go bowl. With the more popular joints, you may need to. Bagele: and other breads. As you might infer from the name, bagele are Israeli bagels, but they’re larger and more oval-shaped than the ones we usually get. You can buy them from street vendors for around 5 shekels (a little over a dollar) and they come with a paper twist of za’atar for dipping. 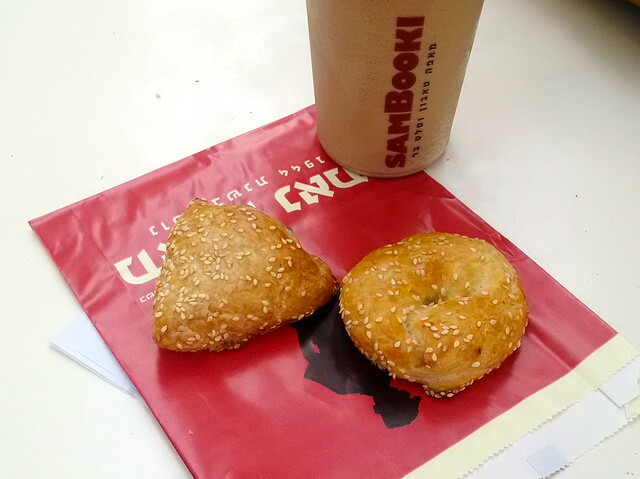 Bourekas: Israel does bread and pastries extremely well. 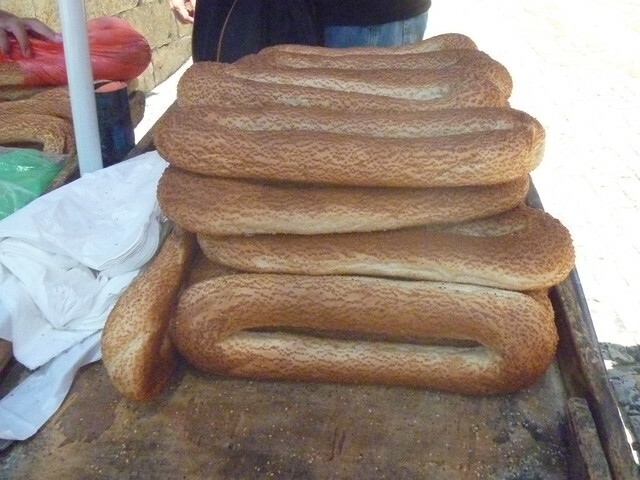 Bourekas have variants all throughout the Middle East and Mediterranean, but they’re especially popular here. These are savory pastries made of phyllo dough filled with cheese, potato, and/or vegetables and come in all shapes and sizes. I think the shapes are supposed to be fairly standardized to indicate the filling but I haven’t really figured out the system yet, so I just either ask or choose one that looks good and get surprised. I stopped by a local chain bakery this morning and got 2 small ones for breakfast: potato with mushrooms and cheese with olives. Yum. Baklava: I may be starting to stretch the definition of street food here a little by including desserts, but I’m already on the subject of pastries so I’m going with it. Pronounced “bah-KLAU-wuh” here (the Israelis were confused when I said it the way we do back in NY), this is an incredibly rich and sweet dessert made with layers of phyllo dough stuck together with honey and ground nuts. There are what seems like dozens of different varieties available at the markets and bakeries, and I’m determined to try as many kinds as possible. Halva: Now I’m really stretching it, since you totally need a knife to cut thin slices of your halva so it definitely doesn’t qualify, but it’s basically my favorite thing ever so I had to include it. Another very rich Middle Eastern sweet, halva is basically just sugar and ground sesame seeds (or sometimes nuts), formed into a dense loaf or cake. I buy it fairly often at a specialty store back home, but there we get three flavors: plain, marble, and sometimes chocolate covered. 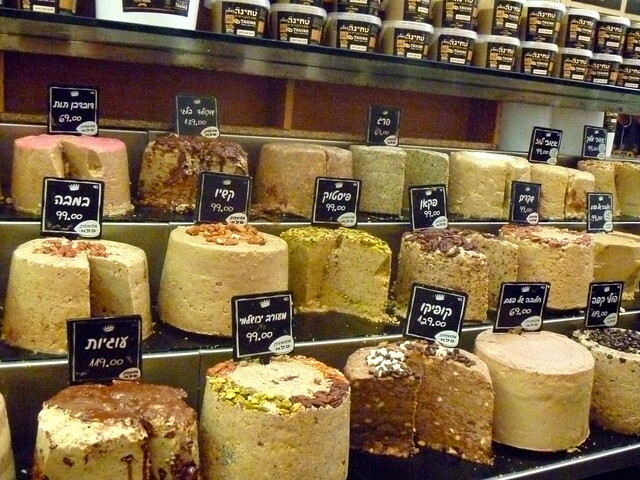 So I nearly went into shock when I visited Mehane Yehuda Market in Jerusalem and saw that they have dozens of different flavors here! I’m glad! I’m craving some of these again already. I just crossed the border into Jordan yesterday and so far the food here isn’t as good. 😦 I’m hoping it picks up again! The bagele is so good! And cheap. But all the breads I’ve had here have been amazing. Absolutely delicious food–and food writing! 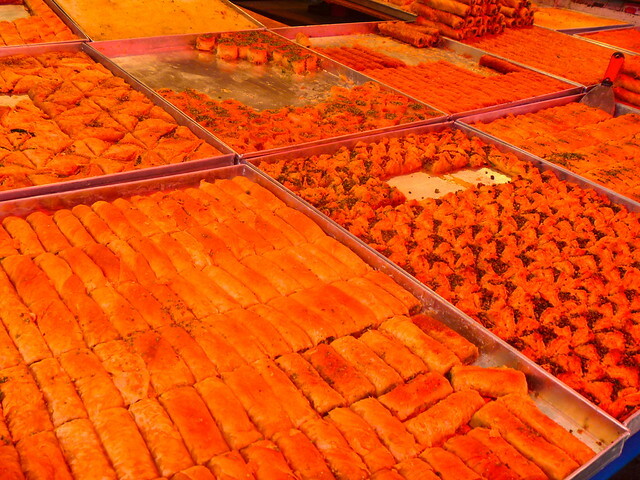 Thought you’d enjoy this article from the Times today about a Turkish city known for its baklava…enjoy! Also great photos of wall art/graffiti! Thanks for the article, Jessica! I’ll have to check it out when/if I get to Turkey!